Between debates, endorsement meetings, and our own campaign parties, it's been a whirlwind of a week! Here's a quick recap. TUESDAY: Thea started her day with an 8am breakfast meeting, then went straight through conference calls, canvassing, an educational bike ride, and four (count 'em) endorsement interviews. 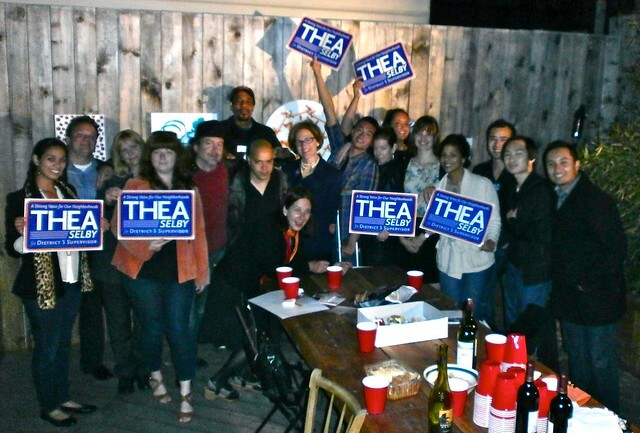 Our team meeting wrapped up at 11pm at our headquarters at 791 Haight. Thank goodness for coffee. WEDNESDAY: Another day of meetings and phone calls to rally our volunteers for the weekend and the weeks ahead. That night we had a meeting with the wonderful folks at the San Francisco African American Chamber of Commerce before a debate at the Harvey Milk Recreation Center, hosted by the Wigg Party among others. Our emcee ran a tight ship and all the candidates got a chance to talk about sustainability and green living. photo by the pointed, irreverent, and reliable uppityfag. THURSDAY: More meetings, more lunches, more phone calls, more emails! Our open-door policy with our headquarters on Haight Street means we spend a lot of time talking with folks who walk in off the street with their dogs, bikes, kids, and stories. On Thursday we got visits from Hal and his dog Jasper, Najah and her brother Jalen who were on their way home from McKinley Elementary, and Annie (who came by for a break during her 40-mile-a-day bike commute). That evening we had a fantastic pair of events: a happy hour at Sugar Lounge in Hayes Valley, and a garden party at Kappa Zakka! Many thanks to Trent, David, Lauren, Philippe, Edgar, and everyone else who helped make the party a reality. We're so happy to have been able to talk to you and your friends, and we're looking forward to working with you as we steam through the last two months of the election.